I'd like to introduce you all to my favourite on-air personality at the moment. See, I'm not particularly a radio person. You know some people go out of their way to tune in to a particular programme or listen to a particular presenter...that's not me...really. 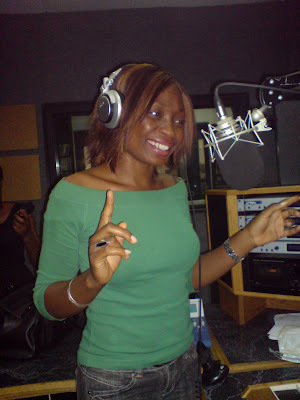 The only on-air personality I used to be into was Shola Thompson of Rhythm 93.7 until he left. And since then I've never really bothered with the radio. But a couple of weeks ago, while riding in a friends car, I listened to a programme presented by a lady on WAZOBIA FM and enjoyed myself thoroughly. And I've been listening to her ever since. I went out of my way to get to know her and she's one of the most interesting people I've ever met. I sent someone to interview her a couple of days ago (for the magazine), and here are some of the things she had to say about herself. "I am the first of many children, in my twenties and an Itsekiri by tribe from Delta state. An introvert with spontaneous bursts of adrenalin. I am a bit weird too (laughs). I enjoy rock and classicals. I am an ardent listener with a vivid imagination. I grew up painting scenes and images in my head. I am very creative...I can paint,write poems and of course host radio shows. 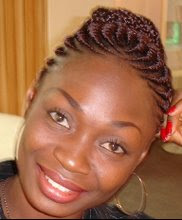 I am the Afternoon show host on 95.1 Wazobia Fm and I am popularly know as "MATSE". I am easy to tell apart from other broadcasters because of my voice and distinct style. I dabble into family affairs and matters of the heart,which I know is the everyday happenings in people's lives. I also host a musical program called Peoples Choice every Thursday. Some have tagged me the radio equivalent of Oprah Winfrey lol. I am pretty new in the entertainment business. Actually working as a radio presenter came by chance but I am glad I grabbed the opportunity. It totally showcases my talents and abilities. Radio is for people with a lot of spontaneity and that, I have got in abundance. Six months into the job I got an award from an independent body as "The most captivating presenter of this generation". Lots of letters of commendation from private institutions and government bodies and presently, I am hoping to be among the nominees for on-air personalities in the Future awards. Naturally I am a go-getter, I don't quit until I get to the end, I love to get results and I love to please my fans." And above all, she's a sweetheart. If you're in Lagos, tune in to the afternoon drive every day to listen to Matse on 95.1 WAZOBIA FM and if you have the time, please nominate her for FUTURE AWARDS ON-AIR PERSONALITY OF THE YEAR. She deserves it. There was a show I choreographed for a Telecoms company two weeks ago and I wanted to run mad. I usually provide models for shows I choreograph but this people brought in their models...who had no clue. Luckily I work with guys who know how to choreograph so I passed the job onto them. Oh by the way, I got into a fight today. I usually don't bother with my modeling agency (my sister runs it) but I had to bother this time around. My company provided 36 models for a road show which ended a week ago. They were supposed to be paid a certain amount of money only for them to give me a cheque minus 15grand on each model. Why the reduction I asked? Because the models did this and did that and they were being punished they explained. You want to punish them by reducing their money I asked? Yes they replied. Thank goodness I've been in the modeling business for ten years, that one is what I call play play. Please people calculate 15grand X 36 people. How much is that? You want to take out a whole N15, 000 from models who worked tirelessly for three weeks, because they refused to do a particular thing you asked them to do? What kind of bladdy excuse is that? Who keeps the money by the way? It can't happen sha, not while I'm their agent...laiye laiye. I told my sister to return the cheque and I told them categorically that no Naira will be removed from any models money...not even 1kobo. It's so sad the way people try to exploit models in this country. I never tolerated it as a model and I will not tolerate it as a model manager. You know the funniest part? If this models didn't have an agent, this money would have been taken from their salaries despite the fact that they signed a contract even before they left Lagos for the job...and nobody would have done anything about it. 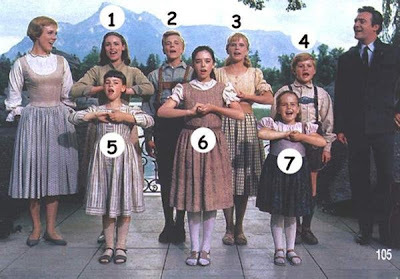 Still remember the 7 children of the Trapp family? and is one of the most popular musicals ever produced. 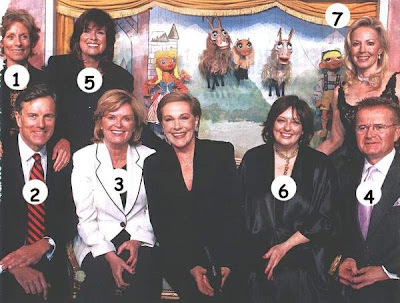 They were having a reunion after 40 years and all were looking healthy and amazingly well. Hi people, still can't upload pictures...seriously don't know what's wrong with my blog setting...how do I give entertainment news without pictures? Anyway, while I'm trying to sort that out...here are the names of Naija's top 10 richest people according to Encomium Magazine. Meanwhile there's something I read in one of our softsell mags today that really saddened me. Nothing pains me more than seeing people making fun or trying to run someone down because they tried something and failed. Urgent memo to singing duo, Peter and Paul. "I am sympathizing with them on their flopped show (yes, flopped is a better word than cancelled) concert which was billed to hold on Tuesday September 30 2008 at Asaba, but developed k-legs due to reasons best known to them. Can I preach to them? In this life, every man must have a focus. The forefathers say that 'If you're a manager, manage well, If you're cook, cook well, if you're a magician, magic well. If you're a singer, face your day job. No one can be a jack of all trades successfully. They should concentrate on their singing career or resign and become show organisers. Please, help me pass on this piece of advise to Peter and Paul...count your tonque with your teeth"
I felt really sad after reading this because I know the kind of damage words like this can do. It's words like this that discourage people from pursuing their dreams and passion. The ridicule from other people when we fail just stop us from trying. When you try something and fail and people tell you to 'count your tongue with your teeth', you're pretty much done for if you don't believe in yourself, your talent and in your ability. I keep saying people, pls don't let anyone tell you what you can do and can't do. And it's better to try and fail than not try at all because with every time you fail, you learn what not to do and become one step closer to understanding what you need to do to succeed in life. Peter and Paul...better luck next time. From that to something really...crazy. Someone filed a court case against God. I'm trying to give you entertainment news but I can't upload pictures. Don't know what's wrong. The link on top of my 'create post' has disappeared...since yesterday. I always feel guilty when I haven't blogged for at least three days...I've just been having such...a week. Nothing to really blog about today, just stopping by to hi to everyone and also tell y'all that our all time favourite Naija blogger, Bella Naija, now has a new website. It's so fine, so international, so informative and on it's way to being Africa's number 1 music, style, movie, tv and beauty website. I'm so proud of her. The time, money and effort required to manage a website is no joke. Moving on... Kachifo Limited, publishers of the Farafina Imprint, would like to invite you all to a book reading and book signing session. Eghosa Imasuen, author of To Saint Patrick will be reading at Bambuddha Restaurant/Lounge bar, 21 Karimu Kotun Street, Victoria Island, Lagos at 4pm on Saturday, October 18, 2008. To Saint Patrick and other Farafina publications will be available at the venue. The first five people to arrive the venue will get free copies of the book! I've never been to a book reading, I think I'll check this out. See some of you there! And live like you will die tomorrow"